We are pleased to announce that the following 4 recipients have been selected as recipients of the 4th Matsuno Environmental Science Award. Please visit links below to view abstracts. Full-text papers are available for those with Hokkaido University Repository HUSCAP registration. Award recipients will be recognized at a ceremony at 3 p.m. on September 28th, at the Graduate School of Environmental Science Homecoming Day event (Please refer to Homecoming Day 2018 for more details). Graduate School of Environmental Science established the Matsuno Environmental Science Award in 2015. 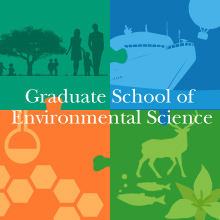 This award recognizes outstanding research conducted by enrolled students, alumni, and alumnae of the Graduate School of Environmental Science. Hokkaido University issued a press release regarding the research conducted by the research group that includes Naoya Kanna (alumnus of our graduate school), Prof. Shin Sugiyama, Assoc. Prof. Yasushi Fukamachi (Division of Earth System Science). This research outcome is published in Journal of Geophysical Research–Biogeosciences. [Press Release] What’s behind the retreating kelps and expanding corals? Hokkaido University issued a joint press release regarding the research conducted by the research group that includes Assist. Prof. Jorge García Molinos, Assoc. Prof. Masahiko Fujii, Prof. Yasuhiro Yamanaka (Division of Environmental Science Development). This research outcome is published in Proceedings of the National Academy of Sciences of the United States of America. Associate Professor Takeshi Horinouchi gave an invited lecture at COSPAR2018 held from July 14 to July 22, 2018 in Pasadena, California, USA. COSPAR or Committee on Space Research is an international organization that promotes scientific research in space, and calls a General Assembly every second year, which is one of the biggest conference in space science. Hokkaido University issued a press release regarding the research conducted by the research group led by Assoc. Prof. Kyoko Miwa and Izumi Aibara, a Ph.D. student (Division of Biosphere Science). This research outcome is published in Plant Physiology. Urban areas represent the fastest growing ecosystem on earth, in which the development of cities dramatically changes the biotic and abiotic environment to create novel ecosystems. Despite the importance of urbanization, we have little understanding of how urbanization affects the evolution of species that live in cities. In this talk, I will review our current knowledge of about the effects of cities on multiple evolutionary processes, including mutation, gene flow, genetic drift and natural selection. I will then describe our work examining how these evolutionary processes affect the ability of plants to adapt to urban environments. I will conclude with a discussion of existing gaps in our knowledge and a description of the first global study of urban evolution, in which we are looking for Japanese collaborators. Johnson MTJ, Munshi-South J. (2017) Evolution of life in urban environments. Science 358, aam8327. Thompson KA, Renaudin M, Johnson MTJ. (2016) Urbanization drives the evolution of parallel clines in plant populations. Proceeding of the Royal Society B: Biological Sciences 283, 20162180. Johnson MTJ, Thompson KA, Saini HS. (2015) Plant evolution in the urban jungle. Am. J. Bot. 102, 1951-1953. Hokkaido University issued a joint press release regarding the research conducted by the research group led by Prof. Fumio Mitsudera (Division of Earth System Science). This research outcome is published in Nature Communications. Hokkaido University issued a joint press release regarding the research conducted by the international research group that includes Assist. Prof. Yoshinori Iizuka (Division of Earth System Science). Hokkaido University issued a press release regarding the research conducted by Shinnosuke Kagiya, a Ph.D. student of Division of Biosphere Science, and Assoc. Prof. Shunsuke Utsumi (Division of Biosphere Science) and their collaborators. This research outcome is published in Molecular Ecology, a top journal in evolutionary biology/ecology.